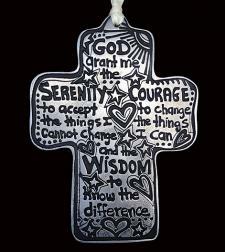 This Beautiful Serenity Prayer Cross is made of solid pewter. The Serenety prayer is full of hearts and stars with a little sunshine to brighten any day, making this the perfect gift for anyone in recovery. It can be hung as an ornament or on a wall like any traditional cross.